« What Is Included in a Pods Moving Rate? Storage is one thing a lot of families have to deal with, especially after downsizing or having kids. Whenever new things enter the home, those things have to be put away and stored properly in order for your home to function properly and remain aesthetically pleasing. Finding the right place for everything is important, but it can also be very difficult. Luckily, there are certain things you can do to make storage easier. This list gives you an idea on what the best of those things are. 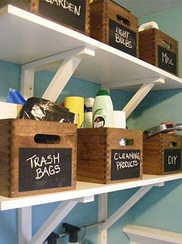 One mistake that many people make when organizing is not taking advantage of their vertical space. While this point may not be aesthetically practical in rooms like the living room or kitchen, storage areas like the basement or garage should all be organized so that every inch of the wall is covered by some sort of shelving or cabinetry. By going up with wall storage, you are making your space work for you instead of the other way around. Using what you need one of the best storage solutions, and though it is also the most simple, it will work wonders on your storage problems. By simply getting rid of the things you don’t need, you will free up a lot of space in your home so you have more room to store more important things, or simply use that space for something else. Before you start loading those shelves, consider having a garage sale or taking a trip to the thrift shop. One excellent thing you can do to increase the efficiency of your home is make your decorative pieces function as organizational pieces, too. You can vastly improve the look and flow of your home by using functional decorative items in every room of the house, from your kitchen to the living room and even your bathroom. That way you don’t have to sacrifice style for function. Access supersedes density. If you pack everything so tightly in your basement that you can’t reach one thing without disassembling an entire structure, you’re going to find the entire process very frustrating and time consuming. If you find that you simply have too much stuff, you should once again consider getting rid of some things to make room for others, or you should perhaps look into getting a storage shed.